For the 50th (!) episode of F This Movie!, Patrick and JB use their stupid human minds to defend the so-called worst movie ever made, Ed Wood's Plan 9 from Outer Space. The worst movie I ever saw was sold under the title "Crazy Fat Ethel 2" although the actual title was "Criminally Insane 2". The title it was sold under at least made it sound like a wacky slasher movie, which it isn't. It's just bad. just finished this podcast and I love the f this movie podcasts. I have listened to them all. I especially loved The Graduate podcast, that is one of my favourites. 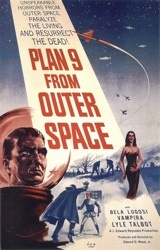 I've always thought that Plan 9 From Outer Space is the worst movie of all, but I've changed my mind after listening to your podcast. Perhaps it should be re-titled: The greatest worst movie ever made, because it has survived the test of time. I love movies and watch it every couple of years as much as I watch my favourite films, like The Graduate. I think the worst movie ever made a tie between Star Trek V: The Final Frontier (1989)and Jaws the Revenge (1987). They are just so terrible. There are much more bad movies than good movies, especially now. Thanks, and continue the good work. I totally agree with you about how today's "comedies" are worse than Plan 9. There's a certain charm to it. Is it a great movie? No. But calling it the worst eliminates a lot of crap that replays on cheap cable after a box office flop. I don't know if you've seen it or not, but Samurai Cop is a popular "bad movie," although I don't think it really meets your criteria for the worst ever because it's still quite entertaining.